I’m still working on my goals for the year. Here’s what I did in May! Our living room at our old house was very brown. And when we moved our new living room — chock full of beige wall to wall carpeting — was even browner. It held three brown bookcases, a brown coffee table and a beige couch with brown throw pillows on it. Browny, brown, brown! If you look at my pins on Pinterest or if you’ve ever noticed the background of my blog you might have gathered that I like bright, cheerful colors. I do. I like them a lot. But I’m also kind of a chicken when it comes to home decorating and I feel safe buying brown things, so here we are. But no more! 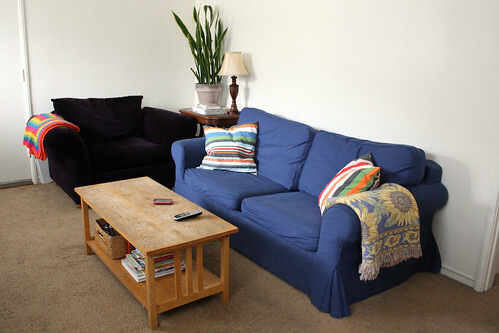 I bought a new bright blue slipcover for our couch this month! And bright striped pillows! And I’m going to make new, brightly colored covers for our old brown pillows too! Much more cheerful. As for that blank wall above the couch, “Goal #31: Frame family photos and hang them” is going to take care of that. #36 Hold another diaper drive for Help a Mother Out. I am so happy to report that I hosted a fundraiser for Help A Mother Out here on Wendolonia and that we raised just over $500! Thanks so much to everyone who participated. HAMO made their goal and in addition to the $25,000 they raised in May they will receive 100,000 diapers from Huggies. I did a bunch of canning this month. 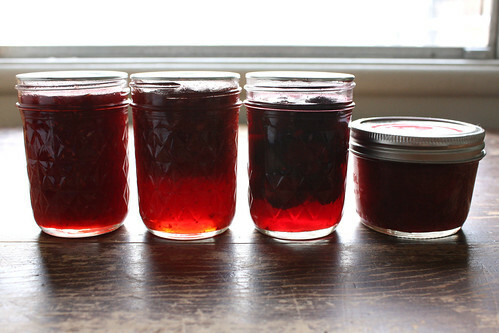 I made strawberry, raspberry and rhubarb jam plus I canned cherries for the first time — my first non-jam canning project! I’m sure a lot of people wouldn’t classify this as a craft project, but I often equate cooking projects with crafting and it’s my goal list, so I think it counts. 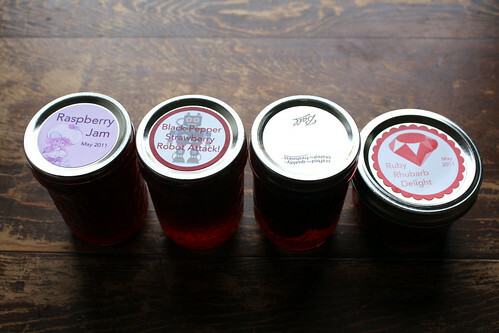 Also, I made my own labels for the jams, so that in itself would be considered a craft project, right? I also reorganized scrapbook layouts this month. This was a big project! To start, I pulled all the layouts out of all ten of my big photo albums. I have a four strap-hinge albums from when I first started scrapbooking too, but I left those alone because everything is glued into them. After I pulled the layouts out, I sorted them into categories: Wendy, Zach, Wyatt, Augie, Us (any combination of our immediate family), Family and Friends, and Activities. Once I had the categories sorted, I put the layouts in chronological order and then I put them back into albums by topic. Before, the layouts were all jumbled together in no particular order. That was fine, but I do enjoy a bit of order in my life, so I’m much happier with them now. I finished another 3 books this month too! First up was Bossypants by Tina Fey. I’m a big fan of Tina Fey and I’ve always enjoyed her work on SNL and 30 Rock. I often wish that I could meet her, because I know we would feel an instant connection and be best friends for life. Or something like that… Once her funny and touching essay “A Prayer for My Daughter” started circulating on the internet, I knew I was going to have to read her memoir. Overall, I thought it was OK, but some chapters were definitely funnier than others. I particularly liked the chapter where she detailed the weekend she appeared as Sarah Palin on SNL, Oprah guest started on 30 Rock and she threw her daughter a birthday party. I also came away with a new girl-crush on Amy Poehler! Next, I read The Wilder Life by Wendy McClure. Have I ever mentioned how much of an impact Laura Ingalls Wilder’s Little House books have had on my life? I’ve read the whole series a couple of times — first when I was about 8 or 9 and then again in college. I’ve also read some of the individual books several addition times. On the Banks of Plum Creek is my favorite of all of them. The sod house, the pine house with glass windows, town party, country party, leeches in the creek, grasshoppers! Nelly Freaking Oleson! There was a good long time when I pretended that every body of water I came in contact with — from my bathtub to actual creeks in my neighborhood — was Plum Creek. To this day, whenever I go on any trip of any length I mentally calculate how long it would take to get to my destination in a covered wagon. But more importantly — and I know this sounds kind of crazy — I credit the Little House books with instilling a pioneer spirit in me. I always loved Ma’s approach to the home arts — the idea that you can add loveliness to your daily work. I’ve always wanted to visit some of the home sites where the Ingalls family lived so The Wilder Life was a way to do that vicariously. In the book, McClure visits all the Little House sites in Minnesota, Wisconsin, Iowa, Missouri, South Dakota and even the Wilder house in New York. She also digs into the Ingalls family history in an effort to separate fact from fiction and tries her hand at butter churning. As McClure learns in the book, visiting these sites can be bittersweet. The books are fiction after all and it’s difficult for reality to measure up to the visions of Laura’s life that we hold in our heads. The Ingalls family led a hard life and their actions were not always as pure and forthright as the books would lead you to believe. I wasn’t always thrilled to learn some of the things about Laura and her family that are revealed as McClure’s travels unfold. Still, I’m so glad that I read this book. It’s reignited my love for the Little House books and I’m planning to revisit them all over the next few months. In fact, just a few chapters into The Wilder Life, I decided I needed to start reading the Little House books to Wyatt. After a bit of searching at the library (WTH?? How could I need to search for a Little House book?) I finally got my hands on a copy of Little House in the Big Woods Book . Wyatt and I have been enjoying a chapter or two each night before bed and we just finished it last night. It was great, of course, but more importantly we’ve been enjoying a ton of jokes about pig bladder balloons since we read the pig slaughter scene.